BlogHelp us find new Prime Minister’s Youth Council members! Help us find new Prime Minister’s Youth Council members! 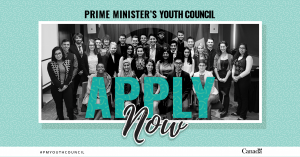 The Government is currently seeking applications for the Prime Minister’s Youth Council. We need your help getting the word out before the October 1 deadline! The Prime Minister’s Youth Council provides non-partisan advice to the Prime Minister on issues that affect all Canadians, such as poverty, climate change and employment. Being on the Council provides young people with a unique opportunity to demonstrate leadership in their communities and across the country. Council members are between the ages of 16 and 24. We look forward to welcoming the new members in spring 2018. With your help, we hope to reach young Canadians all across the country and encourage them to apply. Attached you will find some images we have prepared that you can share on social media channels to help get the word out about this once-in-a-lifetime opportunity for Canadian youth. Share one of our Facebook posts or tweets! If you would like more information on the Prime Minister’s Youth Council and its work, you can find it at www.canada.ca/youth.